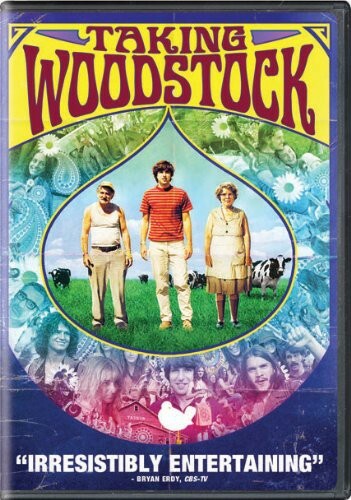 A generation began in his backyard... from Academy Award winning director Ang Lee (Brokeback Mountain, Crouching Tiger, Hidden Dragon), comes Taking Woodstock, a new comedy inspired by the true story of Elliot Tiber (Demetri Martin) and his family, who inadvertently played a pivotal role in making the famed Woodstock Music and Arts Festival into the happening that it was. It's 1969, and Elliot Tiber, a down-on-his-luck interior designer in Greenwich Village, New York, has to move back upstate to help his parents run their dilapidated Catskills motel, the El Monaco. The bank's about to foreclose; his father wants to burn the place down, but hasn't paid the insurance; and Elliot is still figuring how to come out to his parents. When Elliot hears that a neighboring town has pulled the permit on a hippie music festival, he calls the producers, thinking he could drum up some much-needed business for the motel. Three weeks later, half a million people are on their way to his neighbor's farm in White Lake, NY, and Elliot finds himself swept up in a generation-defining experience that would change his life, and American culture, forever.